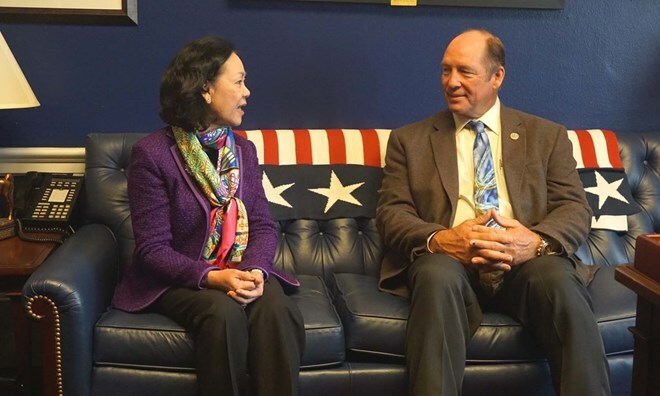 Truong Thi Mai, head of the CPV Central Committee’s Commission for Mass Mobilisation, made the affirmation while meeting with Congressman Ted Yoho, who is also Chairman of the Asia and the Pacific Subcommittee under the Foreign Affairs Committee in the US House of Representatives, in Washington DC on November 30. She said that both sides should increase trust building work to allow bilateral ties to develop in a stable, practical and sustainable manner, for the interests of the two peoples. Expressing his delight over the sound development of the bilateral relations, Yoho said that the US stands ready to bolster comprehensive collaboration with Vietnam, and it will continue to join hands with the Southeast Asian country to remove bottlenecks in the ties. The US attaches importance to Vietnam’s position and role in the ASEAN and considers the country an important partner of the US in the region, he added. During her stay in the US from November 29 to December 1, Mai and her entourage had meetings with the Deputy Assistant to the President, the White House Communications Director and officials from the US Department of State and Department of Labour. She also joined a round-table discussion about gender equality, women in politics, and the Vietnam-US relations with several US researchers, and had talks with the President of the Communist Party USA. At the meetings, both sides talked in-depth about measures to enhance the bilateral relations, stressing that the two nations should continue exchanges at all levels, including through the party channel, while promoting existing cooperation mechanisms. Collaboration should focus on the fields of their interests, including labour relations and law amendment, while continuing to boost trade and investment as the foundation and driving force for bilateral ties. The two sides also agreed to continue priotising joint efforts to address war consequences and humanitarian assistance. They noted that the two sides should enhance cooperation at regional and multilateral mechanisms and forums. The CPV official also urged the US to recognise Vietnam’s market economy. Regarding regional and global issues, the two sides agreed that disputes in the East Sea must be settled by peaceful means in accordance with international laws, particularly the 1982 United Nations Convention on the Law of the Sea (UNCLOS), and peace and freedom of aviation and navigation in the waters must be ensured. The US appreciated Vietnam’s cooperation in implementing the United Nations’ resolutions in the past time as well as the country’s efforts to reduce conflicts and advocate denuclearisation on the Korean Peninsula.